With the warmer weather and outdoor chores starting up, my modeling time has been in short supply. I also have gotten hooked on a computer game ("StarCraft") which takes up time I usually would be doing modeling. With these factors weighing in, my original plans at a quick finish to the U-2 project that I have been working on have been shattered. I have already made a couple of "firsts" on this U-2 project. The first "first" involved my making resin update set masters for a model and getting them get marketed. The other "first" is that this is the first model that I have re-scribed an entire model to engraved scribing. I have gone to great lengths in the past to replace lost raised scribing using a variety of techniques, but I decided on this model to try out the process of re-scribing and see how it works. Having read a number of questions recently online regarding how to do re-scribing, I decided to take a break from the U-2 construction postings and make a posting devoted to just the re-scribing work. While I am no expert on doing this process (remember, this is my first), I feel I can help some people out there with writing about my re-scribing endeavors. I am not going to get into any philosophical discussion of the merits of raised scribing verses engraved scribing in this posting. All modelers have their preferences on this topic. Most all prefer engraved scribing (including myself). Both styles of scribing can look just fine on a completed model. It is a question that modelers have to answer for themselves regarding taking this plunge and re-scribing a model. I can tell you that there is a MASSIVE amount of time-consuming work required to fully engrave a kit that is raised scribing to start with. Add to that a large volume of swearing and cursing, as the scribing tools will invariably slip in the wrong directions in the most visible sections of the model. It is far easier to learn to deal with the raised scribing than to re-scribe even one model. I used a variety of tools for the job. The picture here shows most all of them. 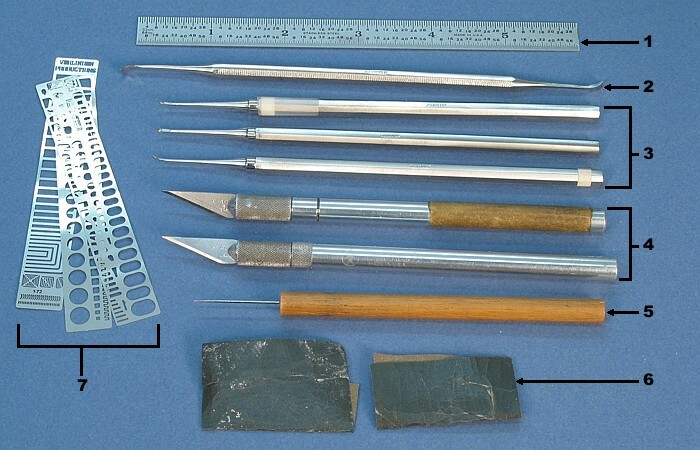 The tools in the picture are as follows. Steel Ruler. Shown is a six-inch size. I also used a sixteen-inch steel ruler when scribing the wings. Squadron Scraping Tool. This is marketed as a means to remove raised panel lines. Its uses are limited and it can gouge the surface of the plastic if used carelessly, but I did use it on removing most all of the raised wing panel lines. Squadron Scribing Tool. I have a few of these. In spite of them all being the same exact stock number and packaging, I found that each is a little different from the others (thinner, fatter, more pointy) and useful for different things. The tape markings on the handles identify which tool is which when I go to use them. #11 X-acto Knifes. I used these the most out of all the tools present. A Sewing Pin (mounted in a wooden dowel). I actually use this more as a super glue applicator, but it has uses in re-scribing, too. Assorted Grits of Sandpaper. These are the primary means for removing the raised panel lines and generally leveling the plastic surface after creating the engraved panel lines. Verlinden Scribing Templates. These come in 1/48th and 1/72nd sizes. I bought these so long ago that I am unsure which set I own. I think it is the 1/48th size set. Take time. This is one process I could not rush. Every time I got a little cocky and started working faster, the tools would slip or I would put a line in the wrong place. Fixing incorrect or botched engraved lines is hard to do without destroying the good lines around them. Be Gentle. It was easy to try to press the scribing tools hard to make lines quicker in two heavy passes instead of six light ones. The problem with pressing hard is that when (not "if") I slipped, the error was significant. If I kept the pressure lighter, a slip did not make such a deep gouge and I could fix the slip with less effort. Like many tasks in modeling, this one has different ways and different tools depending on exactly what I am looking to do. As they seemed the easiest to do, I started with the wings. 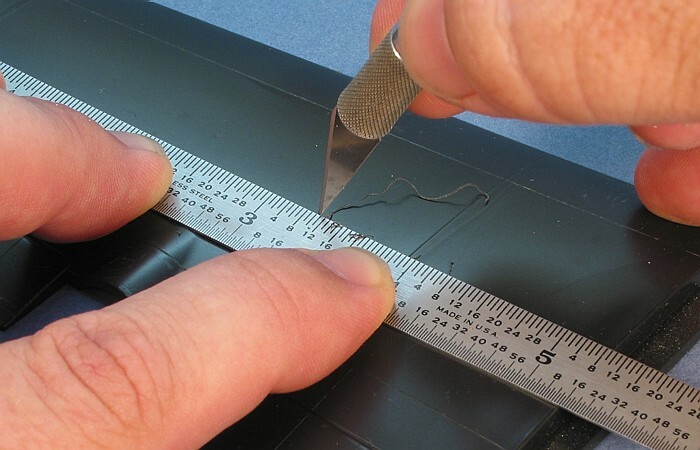 I use only two tools to create the lines for this specific task -- a long metal ruler and a fresh #11 X-acto blade. I did the scribing prior to assembling the wings or attaching the tail surfaces as this allowed me to just lay the parts down flat on my desk and work on them. I aligned the ruler for the line I wanted, then I drew the blade backwards along the ruler three or four times. 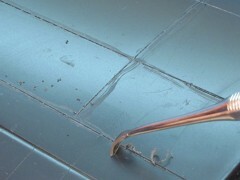 By pulling the blade backwards, instead of slicing the surface, it gouges a small trough -- an engraved line. I used only a little pressure on the blade, barely more than the weight of the knife. As I worked, I was also taking time to relocate any incorrectly molded kit panel lines. I used a new blade in the knife for this as this created the finest line. If I wanted heavier lines, I would use a blade with a part of the tip broken off. Heavier lines would be needed to mark the edges of control surfaces, but the kit already had the control surfaces marked with heavy engraved lines, so I did not need to do anything more for them. Besides, as I using the Cutting Edge wing update set, I ended up cutting off all the wing control surfaces and replacing them with resin pieces. This process could also be done using the Squadron Scribing Tool, but I found the knife blade provided a better line. 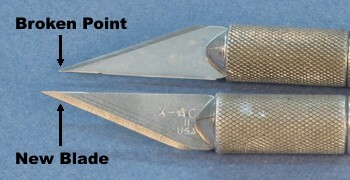 While the knife blade comes to a very fine, sharp point, the scribing tool has a less slender head. The scribing tool's point is just about as sharp, but the head gets fatter faster than the knife blade. This makes the lines wider for the scribing tool than for the knife blade when scribing to the same depth. When all the lines were re-scribed on the wing surface, I used the Squadron Scraping Tool to remove the raised kit panel lines. I had to be careful with this scraping tool as it was more than capable of gouging the surface and making me do excess sanding to fix the gouges. Then, I sanded the entire wing surface with 240-grit sandpaper, followed by 400-grit sandpaper. Since the model was going to have a flat painted surfaces, not natural metal, I did not bother with going any lower than 400-grit sandpaper. The flat paint easily hides sanding marks from 400-grit sandpaper. 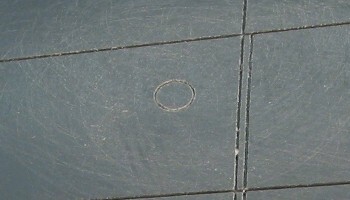 The sanding process fills all the newly scribed lines with sanding dirt. After sanding, I again used the knife blade (being pulled backwards), to clear out the lines. I removed small burrs on the edges of the lines by leaning the knife blade to one side or the other as I pulled it through the lines. I had to take care with this process so as not to over-widen the lines. As it was, they still got wider than I wanted. I figured I would be OK with them, though. The overall black paint of the U-2 will tend to hide details unless they are a little exaggerated. The wings have several small access panels sprinkled over the top and bottom. I left this go for the moment so they could be done after the wings were assembled. Scribing these uses a different technique that I will discuss later in this writing. Rounded surfaces (like the fuselage and super pods) provided a challenge in that the metal ruler I was using could not bend enough to go around them. Thus, I could not use the ruler as a guide. I experimented with the Verlinden scribing templates as they could bend around the fuselage, but they were difficult to hold in place and the contoured fuselage with its gentle tapers complicated getting the template to mark a true line around the fuselage. I also experimented with using tape to help guide the tools. No dice with that, either. I further complicated the process by not re-scribing until after the fuselage was assembled. I did this on purpose, as I wanted to guarantee that the lines going around the fuselage would line up. Waiting for the fuselage to be assembled did this. The solution in the end was to free-hand the scribing. This was not as hard as it seems. I still used a ruler to guide my scribing tool on straight lines run the length of the fuselage. I only did this free hand scribing on the lines the run around the fuselage. I took an older X-acto blade that had the tip broken off. 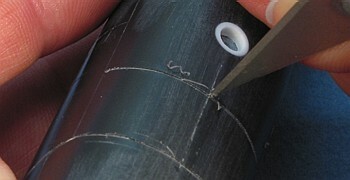 The broken point helped to keep the blade running straight and not wobbly. I pulled the blade forward on the surface, cutting a slice. I followed the molded panel lines as a guide. 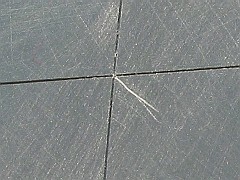 After two passes with this blade going forward, I used a second knife with a fresh blade and pulled it backward through the slice created by the first blade. The slice helped guide the fresh blade as it gouged out the line. I was pretty happy with the workability and results from this process. I only had major slip ups on a couple occasions. After the engraved lines were created, I only used sandpaper to remove the molded kit lines. My experience on doing the wings proved that the Squadron Scraping Tool would do more harm than good on the rounded fuselage surfaces. 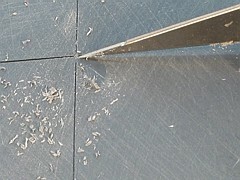 I removed the sanding dirt and burrs from the lines the same way as on the wings. Using the above two processes, I had finished re-scribing the majority of the model. All that remained were some small access panels and a couple larger panels that had rounded corners. I needed a different approach to making lines that were not straight. Here is where I used the Verlinden scribing template the most. The Verlinden template is chock full of various shaped cutouts in assorted sizes. All I needed was a way to scribe the lines that could follow the rounded lines of most of these panels. 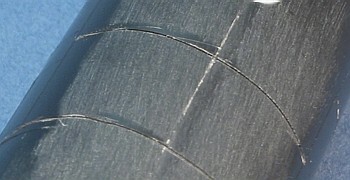 While the X-acto blades work really well on straight lines, they are not good at making curves. Instead, I used the tool that is normally my super glue applicator -- a sewing needle imbedded in the end of a wooden dowel. 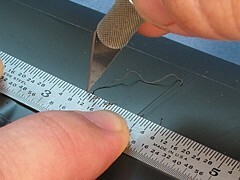 The tip of the sewing needle is a sharp, rounded cross-section point with no directional stability. The process of scribing was simple. I located the template hole that best matched the access panel I wanted to create. I positioned that template hole in the spot I wanted it. I then traced around the template hole using the sewing needle point. I kept the needle pretty much perpendicular to the model surface. Using medium pressure and making about five passes all the way around the template hole, I was able to engrave a deep enough groove into the model surface to capture the access panel. This process pushed up a raised lip around the edges of the engraved panel line, so it was necessary to sand the area after scribing the access panel to remove the raised lips. 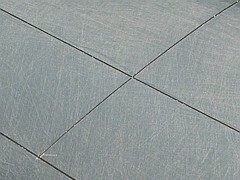 Larger panels with rounded corners were done using a combination of techniques. I would create the straight edges of the panels using one of the previous methods, stopping short of the rounded corner point. Then, I would position a scribing template and create the corners of the panel. I needed to take care that the lines met properly and that the line weight matched, but the overall process was not that difficult. A few of the access panels were larger than any of the Verlinden template holes but not large enough to scribe using the previous methods. For these, I cut my own templates from 0.010" sheet styrene. I used these custom-made templates exactly the same way I was using the Verlinden ones. All this discussion of how to do the deed sounds good. However, if you choose this insanity for yourself, be sure to also plan on messing up a few times. No matter how carefully I held the ruler, once in a while it would slip. Or, no matter how carefully I drew the scribing tool over the model surface, once in a while it would stick on some invisible obstacle, and as I pull a little harder to free it -- WHOOSH! -- it skipped across the model leaving an unwanted line. 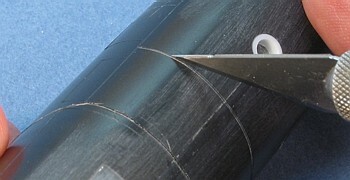 Part of making the new engraved lines is knowing what to do to remove unwanted engraved lines. Fixing errors has two basic methods -- remove them or fill them. Which method I used depended on several factors. 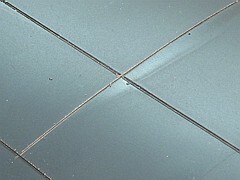 Minor light lines can be removed with some sanding or scraping without hurting much else. Deeper lines needed filling. 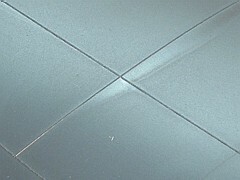 I generally will scrape unwanted light lines using a X-acto blade. If I used this method on deeper lines, there was a more noticeable low spot where I scraped away the line. A light sanding of the entire area helped hide this. Besides, many aircraft have slightly uneven points on there skin. 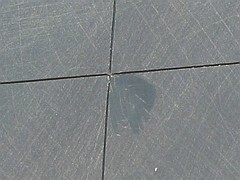 The slight difference in the surface was a welcome "weathering" point on the surface. Filling an error requires patience. Using the tip of a needle, I apply extremely small amounts of super glue to the error line. I have to keep the amounts small so as to avoid having the glue run into the good line that is right next to the error line. For the same reason, I do not accelerate the super glue. Accelerator can cause the glue to run in all directions in the split second before it cures. I just apply the glue and leave it alone. In small quantities, the glue cures rather fast, anyway. After the glue cures, I sand/cut/scrape the glue to level it out. It generally took a coating of paint to be sure I filled the line completely. Well, there you have it. These are the procedures I used to re-scribe my first totally re-scribed model. As I said at the beginning, it is a time consuming process that really can not be rushed. But, if you insist on having engraved panel lines, for many subjects, this is your only choice. I can tell you that, barring some unforeseen fit of insanity, this is my first and last totally re-scribed model. I'm sure there are plenty of techniques and methods beyond what I have shown here. I can only say that this worked for me. Your results may differ.